I like to sketch during meetings at work because it actually helps me pay attention to the discussion at hand. 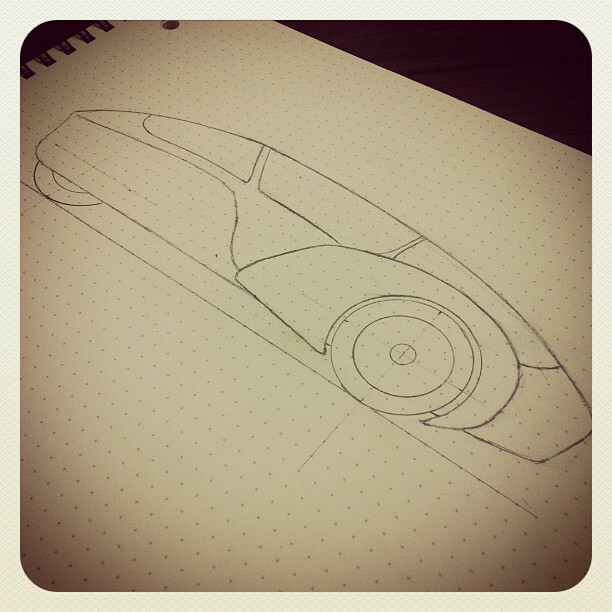 Earlier this week, I was thinking about the Streetliner and figured it was time to do a fresh sketch. Where that sketch went was less about my current design, and evolved into something interesting. Something longer, and even more aggressive than my current design. 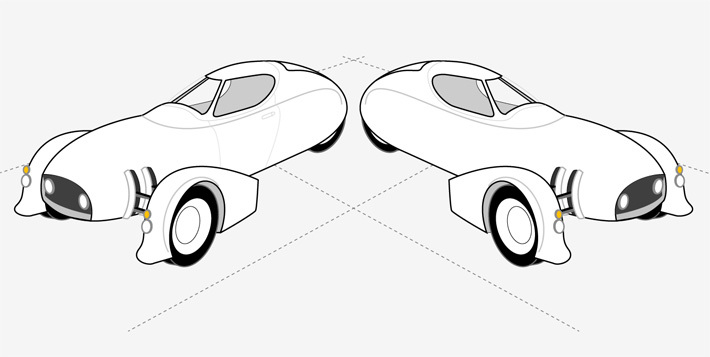 Most importantly, I see this as a two-seat (in tandem) vehicle with lots of windows. I’m thinking a much larger power plant, like that out of a Goldwing, and a fully-enclosed design. With all that I’ll surely learn building the Streetliner, this second generation vehicle ought to be pretty straightforward to create. Author Nathaniel SalzmanPosted on November 3, 2012 Categories Exterior Design, Inspiration3 Comments on The Streetliner II? Nothing big here, just some new details. 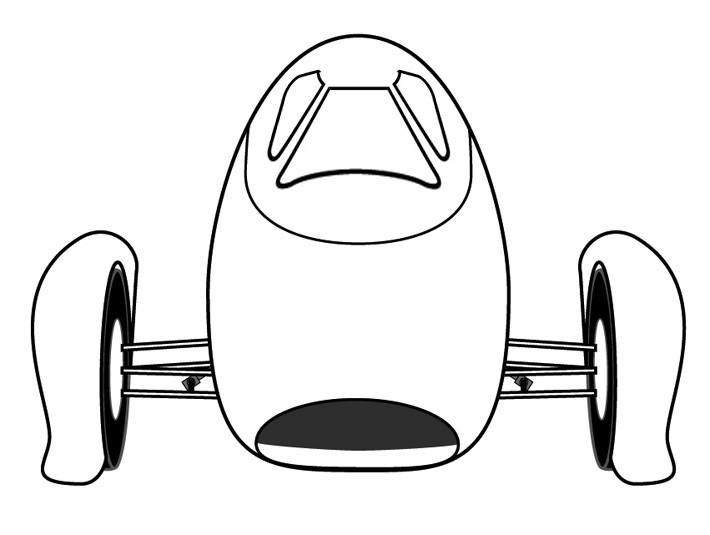 This rendering shows an adjusted cockpit position, door opening, and A-pillar spread. I’m considering flopping the door to the other side as left side impacts are more common on motorcycles. That would also mean a curb-side exit in the states. What I think is particularly interesting is just how much the forced perspective changes the visual relationship between the wheelbase and the width of the body. 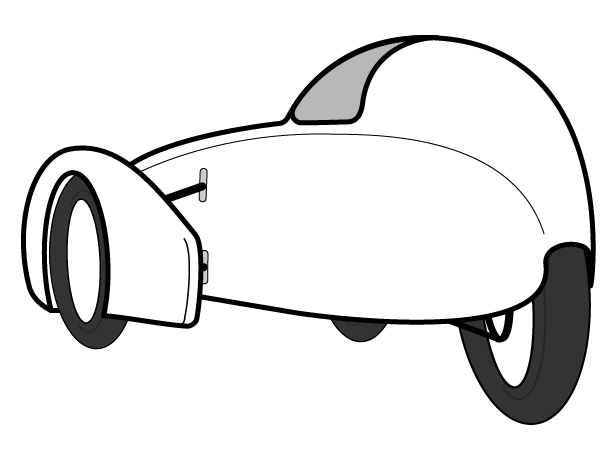 In the front view, you can see just how far apart the wheels are, but in the other views, they look like they’re right on the body. 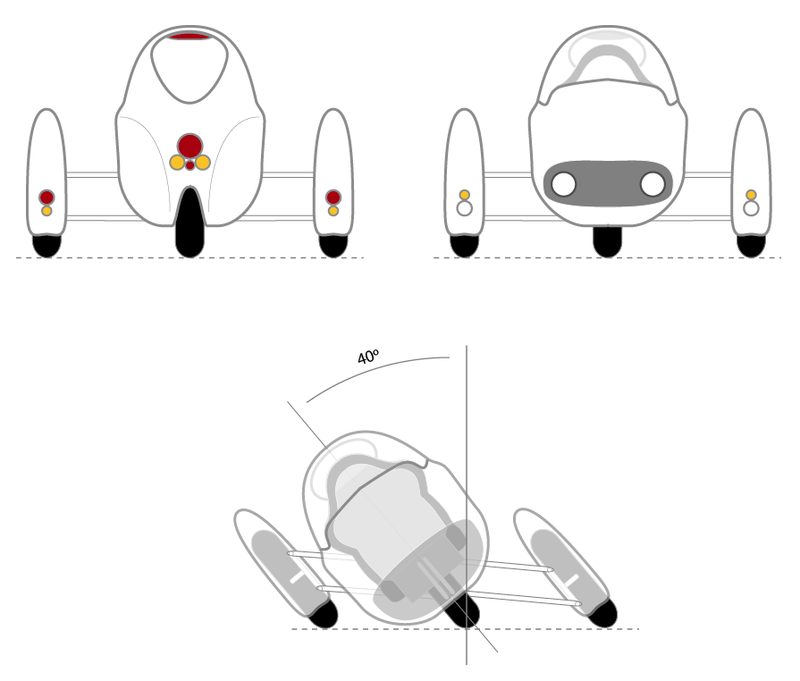 It’s also interesting how it looks really mean from some angles, and just a tad messerschmitt from others. While discussing the Streetliner with my collaborators at work, the subject of the canopy came up. That sparked an idea for me. Rather than having to form (or pay to have formed) a singular canopy, it’d be a lot simpler to build the canopy in sections. Each of those sections would be much smaller and much easier to make. 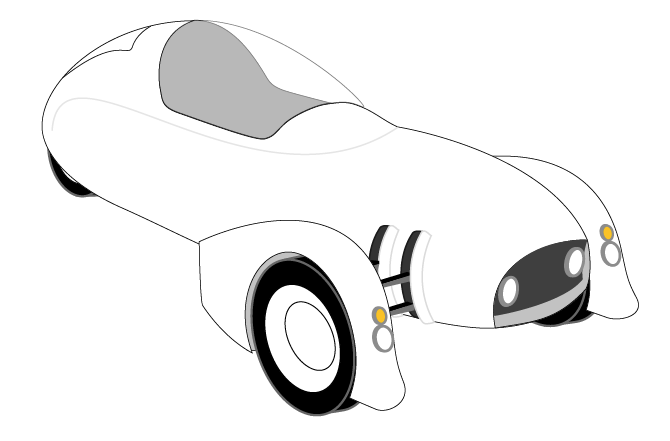 I think I could pretty easily create forms and heat-bend polycarbonate panels for the windows and windshield. 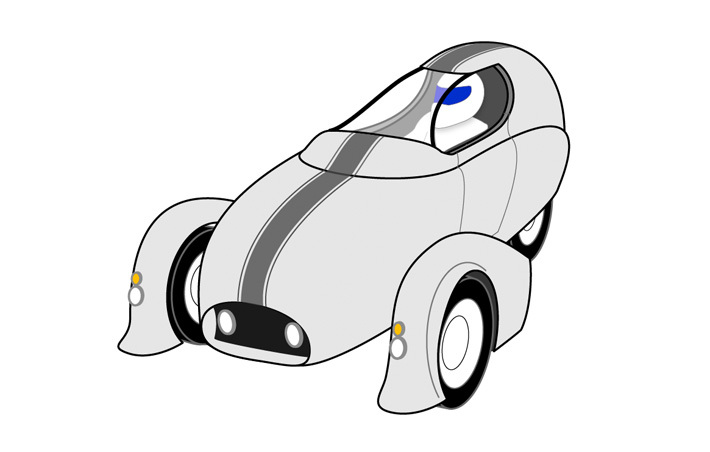 In fact, in this configuration, a glass windshield might even be viable if it weren’t too expensive to get fabricated. But beyond ease, having a roof on the canopy would mean the cabin would be cooler. It’s also that much meaner looking. I like that too. I’m gaining more and more momentum when it comes to finalizing the Streetliner concept. I’ll be putting together a more comprehensive full spec post later, but for now, here’s an update on the exterior design. I feel like I’ve finally found the art deco mojo I’ve been looking for all along. While the updates are subtle from concept Echo, a lot has gone on under the skin to help me arrive at this, the most finalized shape to date. Most significantly, I realized that my seat and human analog were actually too large, as was my representation of the ATV drivetrain — each by about 20%. 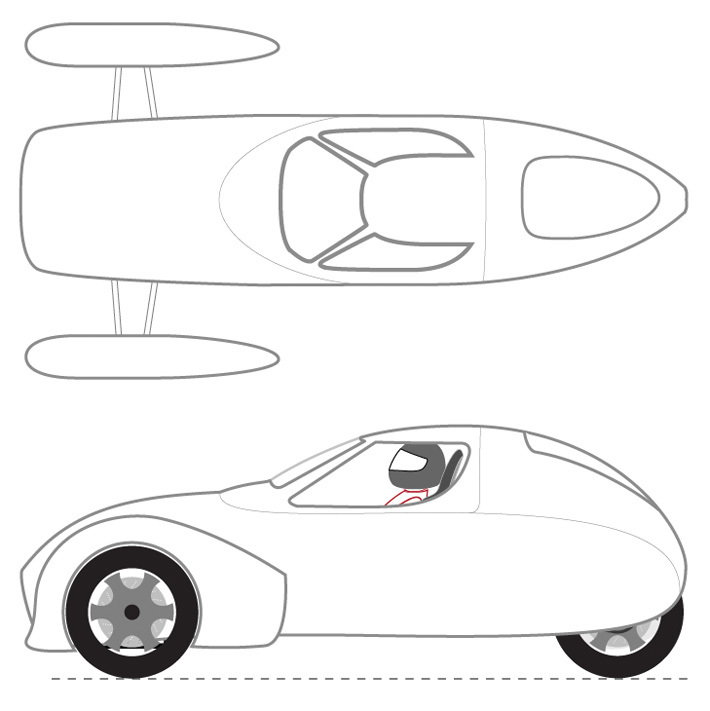 This meant that I could shrink the wheelbase as well as the cabin size by significant amounts. I had previously been concerned about the front to back balance of a rear-engine design, but these new proportions make it seem like it won’t really be an issue. I accounted for a “jack shaft” that will inevitably be required to get proper rear wheel sprocket alignment. It also allows me to more easily monkey with the final gear ratio to the rear wheel. Additionally, it allows for easy fitment of a belt-drive, which will require much less maintenance than a conventional chain. I reworked the rear suspension in such a way that I can still get a lot of travel, but I don’t have to build a whole subframe back just to intersect the shocks. I’ve essentially just extended the rear swing arm. 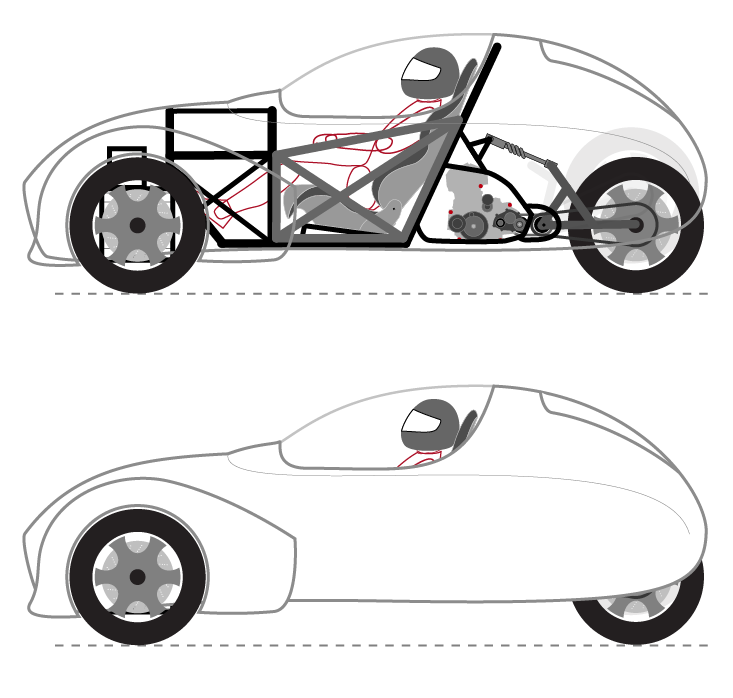 What may not be obvious from the side rendering is that there are arcs involved that would allow the shock(s) to be centerline instead of at either side of the swing arm. 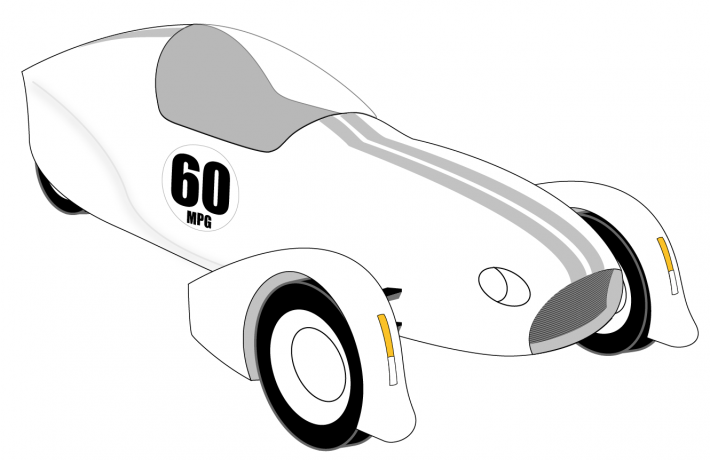 In the rendering there’s a ghosted wheel showing the full 6″ suspension travel. The jack shaft is inline with the pivot for the rear swing arm, which should keep things nice and smooth. 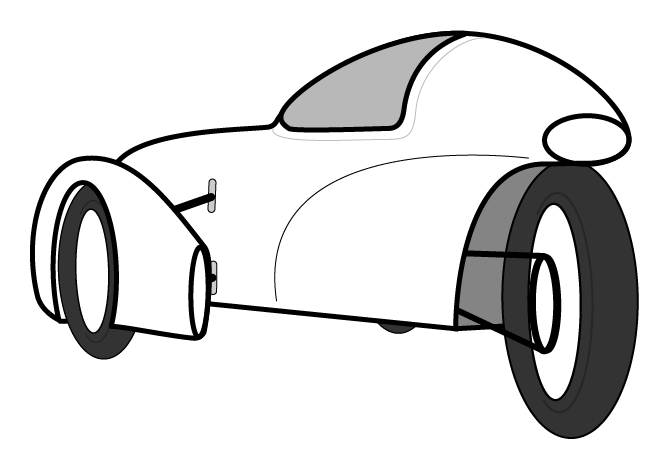 Front and rear, I’ve simplified a few things, and added others. 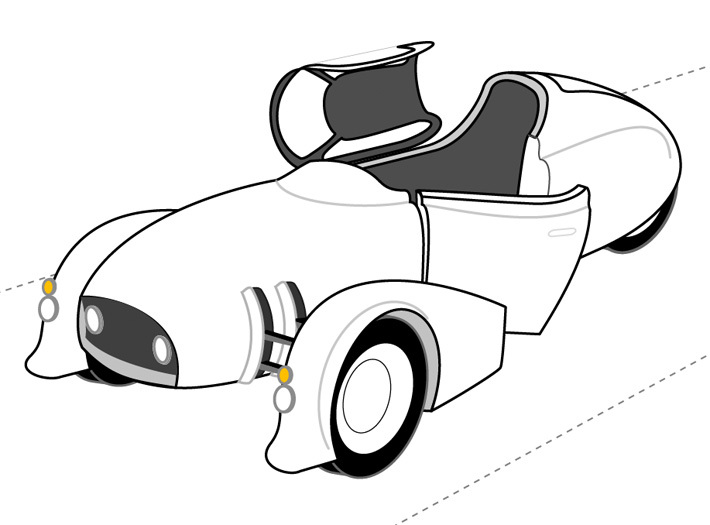 Most noteworthy is the addition of a rear window, which is something I hadn’t had in the concept previously. The view won’t be great, but it’ll be much better than nothing. I’m thinking that rather than a rear view mirror, I’ll utilize a rear-facing camera built into the high brake light assembly. That will have a better view than any mirror system that would conceivably work (although I did have a hilarious rear-view periscope idea). I also abandoned previous modern-style brake lights and turn signals in favor of more conventional round lights. 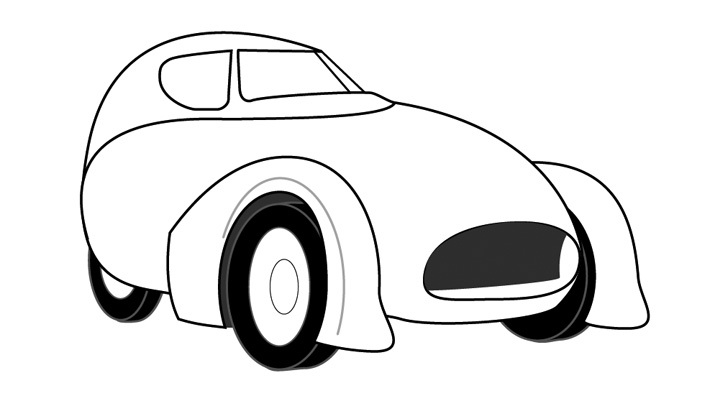 This is actually more in line with the classic design language from cars in the eras I’m trying to emulate. In the end, I’ll be somewhat limited in what I can find off the shelf, but standard round light will actually look better, in my opinion. I was designing those other signals and lights almost in a vacuum. I think they were cool looking, but in the end, such modern details would look out of place in this shape, I think. 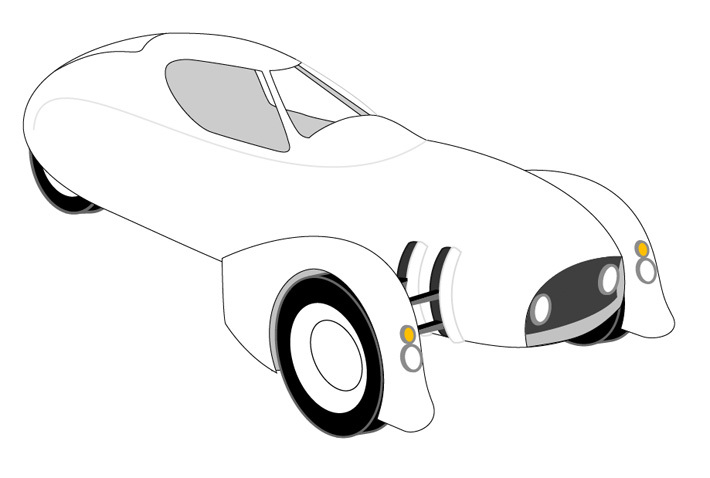 Lastly, I finally paid some real attention to the front cross-section of the vehicle. 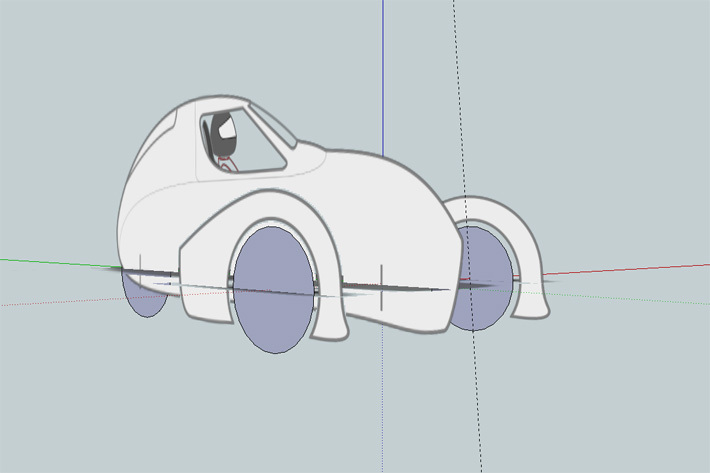 I was able to resolve the shape such that I now have a completely flat front suspension parallelogram, but still enough body and wheel clearance to get about 40º of tilt out of the vehicle before the wheels bind or the body touches the pavement. I know for a fact that I’ve never put 40º of lean on any two wheeler I’ve ever owned, so this ought to be plenty. What’s more the cabin ought to be pretty comfortable, with little compromise toward comfort. It should just fit me, but with some reasonable room for comfort. So let’s hear it. What does everybody think? If you’ve got other ideas, now is the time for them. As far as I’m concerned this is the design I’m moving forward with. I’ll hopefully be starting a small scale foam shape prototype today and I’ll share progress as soon as there is any. I’ll also be doing some small-scale safety cage models, likely in brass tubing, for structural testing and evaluation by people who know more about this crap than I do. 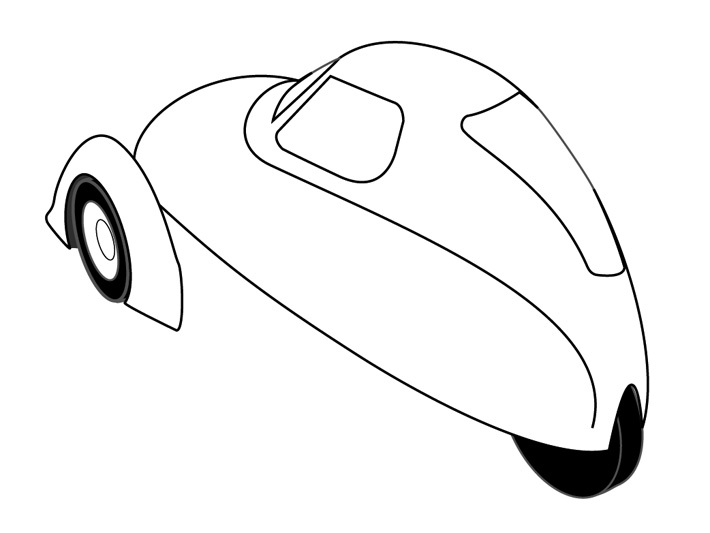 It’s little more than doodles at this point, but this is Concept Echo for the Streetliner. Of all the concepts I’ve rendered ’till now, this one is easily the closest to what I’ve seen in my head in terms of its sensibility. It’s got some wonderful ’30s and ’40s era automotive cues, but also some modern flair. Most of all, the rear end is really feeling the streamliner locomotive, art deco vibe I’ve wanted to always have present in this vehicle. The next step, I think, will be to render it in floral foam, then shell and paint a mockup. 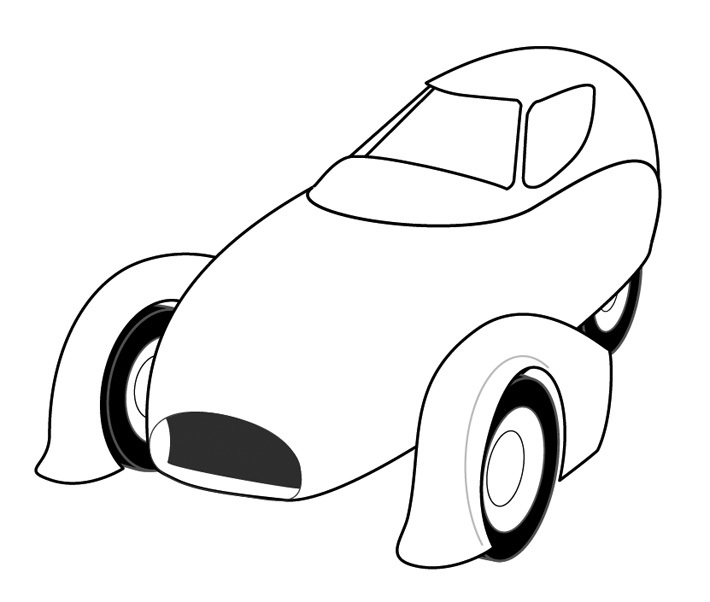 I’ll be doing this at a much larger scale than before, set off of 4″ wheels and built onto a sort of mockup under-chassis that should let me fit a number of test body shapes moving forward. Think of it as the small scale prototype for shape and aesthetics, rather than mechanicals (that’s a separate, ongoing thing all its own). I’ve never really rendered the Streetliner from this angle, but I’m loving the way it looks from behind. No tail lights or turn indicators, obviously, but the shape is very pleasing. 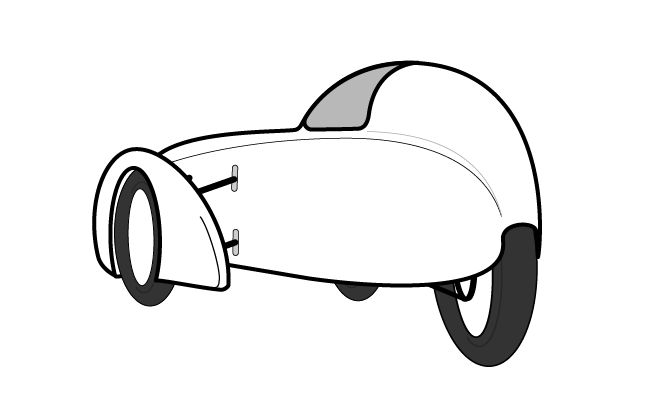 This is based on the ATV drivetrain I’ve been thinking through lately. 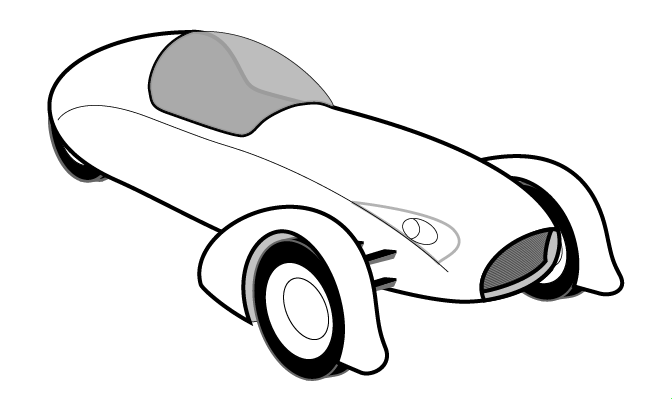 Based on the entry/exit concept discussed in my previous post, here’s a 3/4 front rendering of what that new, evolved shape might look like. Any thoughts?